Kwetiauw Goreng (Chau Panthiau) Bangka – HokLo Theng (AKIM) | Bangka Urang Kite Jitjong A.M.
More Story : click here! Makanan Khas bangka : click here! The famous chinese restaurant in Pangkal Pinang (Pinkong) is HokLo Theng. It only provide chinese foods, actually hakka foods, like chau mian, chau panthiauw, mun hoisem, chap choy, etc. The foods are delicious and typical. Let say my favorite chau panthiauw (kwetiauw goreng), in singapore called char kwetiauw, Rp20,000/porsion.not so expensive. What special ? You can eat chau Panthiau (kwetiauw goreng) with Lat Ciau Ciong, hakka special sauce, and Jeruk Kunci. HokLo Theng is from the name of the co-founder. HokLo Hak, HokLo Theng’s older brother is actually the founder. He left the business to his brother while he got others. At the moment, the restaurant is taken care by the 3rd generation of HokLo Theng and it is named AKIM, his son. HokLo Theng is not a really a real name. HokLo is an attribute for him given by hakka people around him. HokLo means Hokkian or Teo Chiu people which has Min An dialect, different from hakka (Hak Ngin). His dialect is Teo Chiu, hakka say Chau Ciu. His name is Theng or A theng. In the early of Indonesian Independence 1945, this resto is the best in town. People come here for meeting, wedding and ordering foods. This resto is not so big, 2 stories and able to cover 100persons. 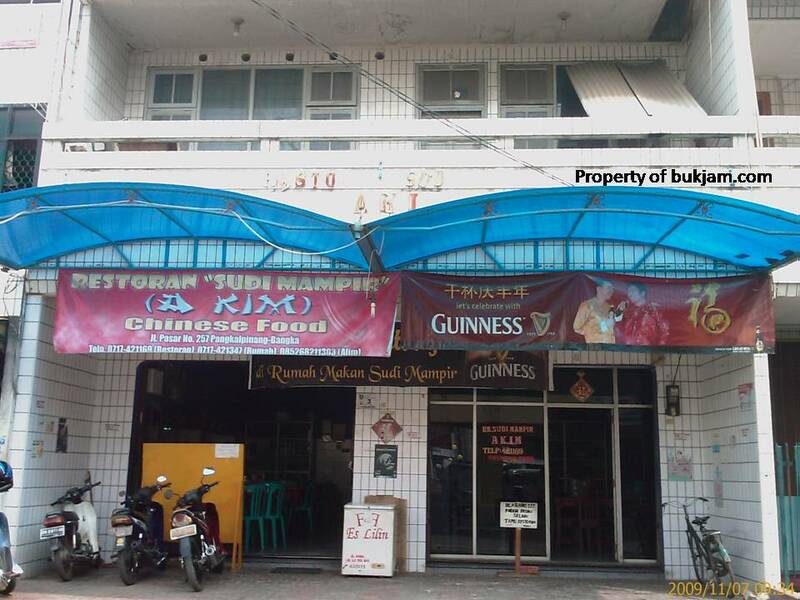 Restoran AKIM (Sudi Mampir), JL. Pasar no.257, Pangkal Pinang, Bangka. Telp : 0717-421169.